Mazy Gulliver has a long history of falling for losers. In high school the loser was Tad Driscoll, wealthy, good-looking Mr. Everything who denied paternity when Mazy became pregnant, leaving her to bring up her son, Tru (now fourteen), on her own. But even for Mazy, her most recent bad judgment was a doozy. She covered for a crooked CEO and ended up not only losing everything but also being charged with conspiracy, serving four hundred hours of community service, and owing $15,000 in restitution. But that devastating experience and some understanding of her behavior acquired through therapy have left Mazy determined to break the pattern. With that intention, she returns to her hometown and demands that her ex Tad Driscoll give her a job. He does; he employs her as a loan collector. It’s not a job likely to endear Mazy to the citizens of Brandt Mountain, North Carolina; nevertheless, it provides an income. Mazy sets out to create a new life for herself and her son. In Mr. Right Goes Wrong, Morsi gives readers two imperfect characters. Mazy is a smart, independent woman who loves her son, but she has made deeply flawed choices in romantic partners. Eli is a genuinely nice guy—kind, loyal, and hard-working, but he is almost too much of a good thing. And his decision to turn himself into a five-star jerk with the help of the Internet is cringe-evoking. Of course, there is humor in the irony of Eli’s transformation occurring at the very moment Mazy begins to see him clearly and appreciate his sterling qualities, but I found parts of this novel difficult reading. Eli enjoys his bad-boy behavior too much at times, and Mazy is too long-suffering. The emotional payoff is large, and I ultimately decided it was worth the uncomfortable moments. However, I’m not sure how many other readers will agree with me. “I’m done with that,” Mazy promised. I’ve been reading—and re-reading—Morsi for more than twenty years, and I count some of her historicals and some of her contemporary romance/women’s fiction hybrids among my all-time favorite books. Mr. 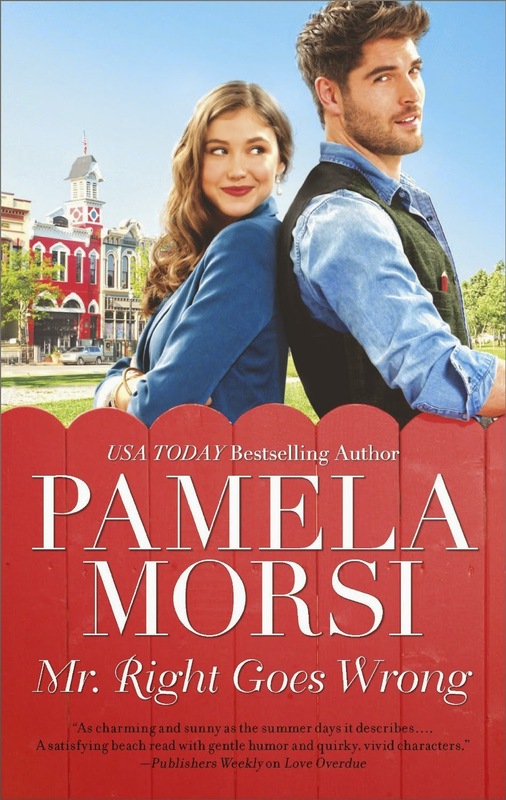 Right Goes Wrong won’t join these cherished keepers, but Morsi, even when she’s not at her best, has the ability to strip away surfaces and show characters in all their complexity, foolishness, strength, pain, general human messiness, and capacity for love. She does so again in this novel, and that makes it worth reading. Thanks for the review on this book and the Andersen book.